The prodigal son was spiritually DEAD during his absence, but he still made a good moral decision to return to his Father. No one forced the son to return, but he made this own decision. The prodigal son went from being 1) alive, to 2) dead, to 3) alive again since we can read: ”for this thy brother was dead, and is alive AGAIN; and was lost, and is found”. His own Father declared his son lost and DEAD while he was away living in sin, so it didn’t help this son at all to still be the physical son of his Father when he was still lost and dead while away. Naturally a person who lives in unrepentant sin, such as fornication and idolatry, can’t be on his way to heaven. 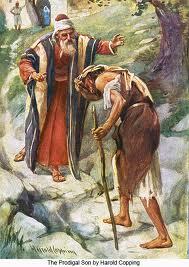 The prodigal son obeyed sin, which means he was a slave to sin and thus a SINNER. We are slaves to whom we obey and nothing impure shall enter heaven. Sinning will always separate us from God and the only solution is repentance. The Father didn’t travel around to look for his son or forced him to come back. He stayed at home, hoping he would return. The son was the one who took the initiative to return and not the Father, but when the son did return the Father rushed out to meet him. There is joy in the presence of the angels of God over one sinner that repenteth! The other brother didn’t lose anything financially by the return of his brother, because everything that his Father owned was already his. He could have taken the chance to be joyful about the return of his brother and that he came back to life. Galatians 6:8For he that soweth to his flesh shall of the flesh reap CORRUPTION; but he that soweth to the Spirit shall of the Spirit reap LIFE EVERLASTING. Corruption is contrary to life everlasting so we should not deceive ourselves into thinking that we are still saved even though we live according to the flesh. The prodigal son sinned together with harlots, so if he had died while still being unrepentant he would never have made it to heaven. Unless you believe unrepentant sinners can enter the Kingdom of God. Luke 15:10Likewise, I say unto you, there is joy in the presence of the angels of God over one sinner that repenteth.11And he said, A certain man had two sons: 12And the younger of them said to his father, Father, give me the portion of goods that falleth to me. And he divided unto them his living. 13And not many days after the younger son gathered all together, and took his journey into a far country, and there wasted his substance with riotous living. 14And when he had spent all, there arose a mighty famine in that land; and he began to be in want. 15And he went and joined himself to a citizen of that country; and he sent him into his fields to feed swine. 16And he would fain have filled his belly with the husks that the swine did eat: and no man gave unto him. 17And when he came to himself, he said, How many hired servants of my father’s have bread enough and to spare, and I perish with hunger! 18I will arise and go to my father, and will say unto him, Father, I have sinned against heaven, and before thee, 19And am no more worthy to be called thy son: make me as one of thy hired servants. 20And he arose, and came to his father. But when he was yet a great way off, his father saw him, and had compassion, and ran, and fell on his neck, and kissed him. 21And the son said unto him, Father, I have sinned against heaven, and in thy sight, and am no more worthy to be called thy son. 22But the father said to his servants, Bring forth the best robe, and put it on him; and put a ring on his hand, and shoes on his feet: 23And bring hither the fatted calf, and kill it; and let us eat, and be merry: 24For this my son was dead, and is alive again; he was lost, and is found. And they began to be merry. 25Now his elder son was in the field: and as he came and drew nigh to the house, he heard musick and dancing. 26And he called one of the servants, and asked what these things meant. 27And he said unto him, Thy brother is come; and thy father hath killed the fatted calf, because he hath received him safe and sound. 28And he was angry, and would not go in: therefore came his father out, and intreated him. 29And he answering said to his father, Lo, these many years do I serve thee, neither transgressed I at any time thy commandment: and yet thou never gavest me a kid, that I might make merry with my friends: 30But as soon as this thy son was come, which hath devoured thy living with harlots, thou hast killed for him the fatted calf. 31And he said unto him, Son, thou art ever with me, and all that I have is thine. 32It was meet that we should make merry, and be glad: for this thy brother was dead, and is alive again; and was lost, and is found.